Of the 16,653 people who died, 8,920 were under the influence of alcohol and were either drivers, bicyclists or pedestrians. Not all the drivers were drunk, almost 4,000 of the fatalities were cause by drivers whose BAC was between .01 and .09. Of the innocent victims, there were 3,972 persons who were either passengers, non-intoxicated pedestrians or cyclists, or sober drivers of other vehicles. This more than 10 innocent victims every day killed because of alcohol use by others. 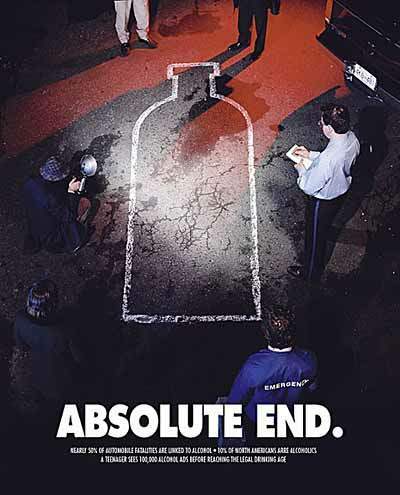 About one half a million people were killed in alcohol related crashes in one single generation of drinking and driving (25 years), in spite of "designated driver" campaigns, in spite of educational programs and lobbying by organizations like MADD, in spite of lower BAC limits and stricter DUI laws. Why do you think that is? Alcoholism is only part of the cause. Alcohol use in general and our culture's attitude toward the drug alcohol is an issue we need to look at closely and be honest in our assessment and vigilant in our awareness of the subtle strength of denial about the true nature of the problem of alcohol in our country. If we have only been minimally successful in reducing drunk driving fatalities in America, how are we ever going to get anyone to take seriously the problem of drinking during pregnancy? While so many people's lives are knowingly affected by drinking and driving, so many others lives are affected by drinking and procreating. One half a million babies are born each year exposed to alcohol. Fifty thousand babies are born seriously affected by prenatal exposure to alcohol. There are no accurate statistics to tell us how many babies die at birth or in the first year of life because of alcohol exposure, because there is no way to realistically determine this number. For heaven's sake, we can't even accurately determine the number of babies born with FAS. One in 100 babies are adversely affected, and only 10% of babies with full FAS are diagnosed before the age of six. (Streissguth 1996) Ignorance, misunderstandings, misinformation, and denial run rampant in the medical community, the social services field, and in the general public. Sometimes I think the only ones who REALLY know how serious the FAS issue has become are the parents raising affected children, individuals with a diagnosis, and the handful of professionals who are committed to helping those who struggle daily to overcome limitations imposed not only by their neurological dysfunction but by the dysfunction of their social environment. In spite of the seemingly insurmountable obstacles that stand in our way (do you know the obstacles to which I'm referring? ), I am not going to slow down my efforts to educate and inform America, to raise awareness among women and youth, to influence policymakers, to pursue prevention and intervention projects, so that I can make a difference in reducing the number of babies born exposed to alcohol and other drugs, and to assist families and individuals whose lives have already been affected.